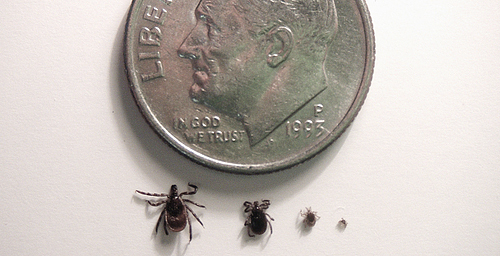 The Lyme disease tick, seen here in its larval, nymph and adult forms, is advancing across "the prairie state." CHAMPAIGN, lll. - A new study offers a detailed look at the status of Lyme disease in Central Illinois and suggests that deer ticks and the Lyme disease bacteria they host are more adaptable to new habitats than previously appreciated. 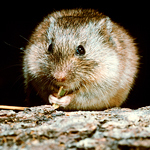 A new study found a potential new reservoir of Lyme disease: the prairie vole (Microtus ochrogaster). Led by researchers at the University of Illinois, the study gives an up-close view of one region affected by the steady march of deer ticks across the upper Midwest. Their advance began in Wisconsin and Minnesota and is moving at a pace of up to two counties a year in Illinois and Indiana. Today the deer tick is established in 26 Illinois counties, up from just eight in 1998, said Illinois Department of Public Health entomologist Linn Haramis. Reports of human Lyme disease cases in the state have more than tripled in the same period, he said. "We've had several years in a row where we've had over 100 cases, up from about 30 per year more than 10 years ago," Haramis said. "It's not a huge increase, but it's been steady and there's an upward trend." Deer ticks are known to do best in forested areas, where they can readily move from small mammals (which provide their first meal) to moist leaf litter on the forest floor, and then to deer, on which they mate. 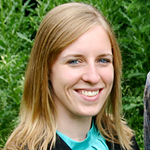 Deer ticks do not pick up the Lyme infection from deer, said Jennifer Rydzewski, who completed her master's degree with the study in the department of natural resources and environmental sciences at the University of Illinois. "The deer tick will feed on a variety of mammals, birds and even reptiles," she said. "But Borrelia burgdorferi, the bacterium that causes Lyme disease, replicates really well within white-footed mice, so white-footed mice are the main reservoir that passes that bacterium on to the immature ticks that are feeding on it." White-footed mice also are forest dwellers. Prior to the new study, little was known about whether, or how, Lyme disease persists in other habitat types. To determine if Lyme disease had gained a foothold in the patchwork of forests, farms and prairies of Central Illinois, researchers trapped small mammals in Allerton Park, a 1,500-acre (600-hectare) natural area in Piatt County. They focused on four habitat types: young forest, mature forest, a flood plain and a 30-acre (12-hectare) patch of prairie surrounded by woods and agricultural fields. The researchers removed deer ticks from the mammals they trapped and tested the ticks for Lyme disease. They found that the immature forest and the prairie hosted the highest percentage of deer-tick-infested mammals, the highest number of ticks per mammal trapped and the highest rates of ticks infected with Lyme disease of the four habitat types evaluated. "The highest prevalence of B. burgdorferi infection was found (in deer tick larvae) from the prairie (27 percent) followed by the young forest (15 percent), the mature forest (6 percent) and the flood plain (6 percent)," the researchers wrote. "Interestingly, all of the positive ticks from the prairie were from prairie voles, not the typical white-footed mouse," Rydzewski said. There also were many more ticks per animal on the prairie voles than on the white-footed mice of the forest, she said. "The fact that we found tick larvae feeding so prominently on prairie voles and those ticks were infected and hadn't had a chance to feed on anything else is a very strong indicator that we are dealing with a different reservoir of Lyme disease that deserves more attention," Mateus-Pinilla said. The researchers hypothesize that when newly hatched ticks find themselves on the prairie, they latch on to the first small mammal that comes along, which in most cases is a prairie vole (white-footed mice prefer the forest). The abundance of prairie voles in the prairie is much lower than that of the white-footed mice in the forest, so more tick larvae and nymphs end up on the same few prairie voles. Since the number of ticks per animal is higher on the prairie, the likelihood of infection is higher there as well. "The landscape of Illinois, especially the northern and central area, is very fragmented with agricultural and other development, so there aren't really big continuous areas that are forested," Rydzewski said. "And so maybe these ticks are finding new habitats to establish themselves in because of the lack of previous habitats." "What's exciting about the new findings is that we are dealing with potentially new mechanisms of disease transmission that we just have not explored and perhaps we do not understand," Mateus-Pinilla said. "We need to think outside of what we already know about Lyme disease transmission." The new study appears in the journal Vector-Borne and Zoonotic Diseases. Researchers from the U. of I. department of pathobiology and Michigan State University also contributed to this study. Editor's note: To contact Nohra Mateus-Pinilla, call 217-333-6856; email nohram@illinois.edu. The paper, “Ixodes scapularis and Borrelia burgdorferi Among Diverse Habitats Within a Natural Area in East-Central Illinois,” in the journal Vector-Borne and Zoonotic Diseases, is available from the U. of I. News Bureau.